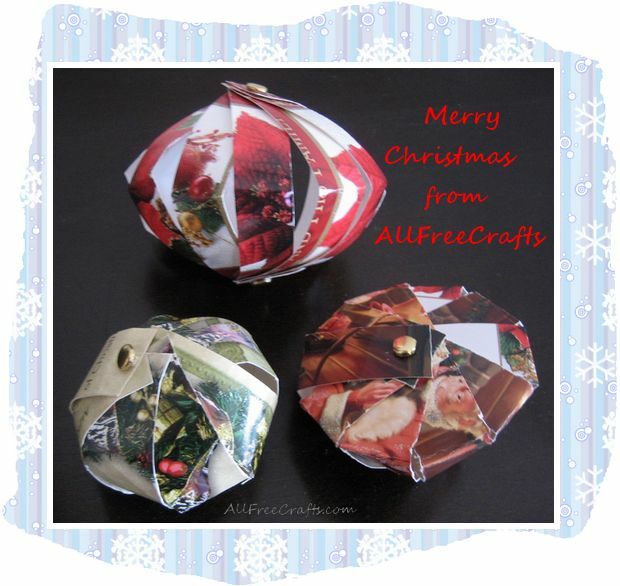 Recycle your Christmas cards and make a variety of colorful ornaments at the same time. 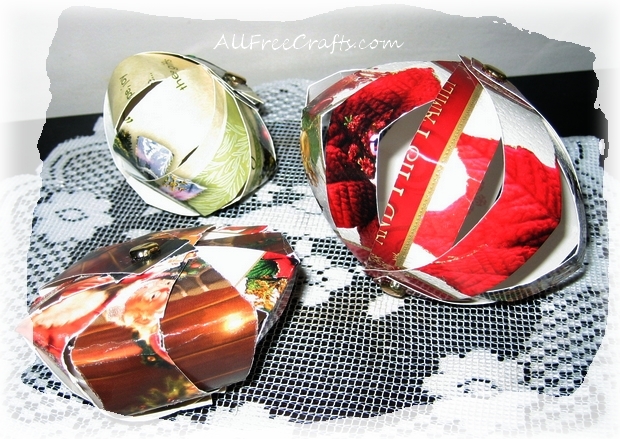 You’ll find these Christmas card ornaments are really easy to make because you begin just by cutting strips from the front of old Christmas cards. After that, you can assemble them in several interesting and charming ways. 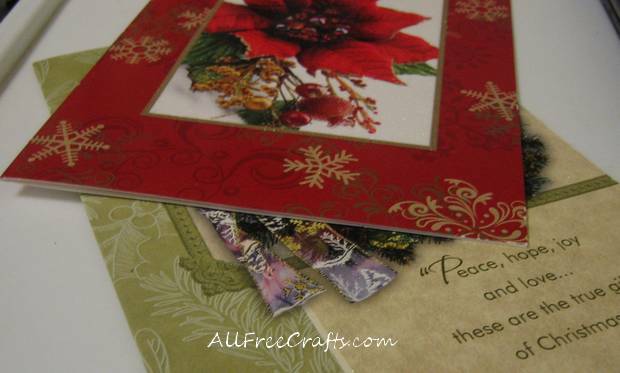 Sort out some colorful Christmas cards and cut off the backs. Set the back sections aside or put them in the recycling box. 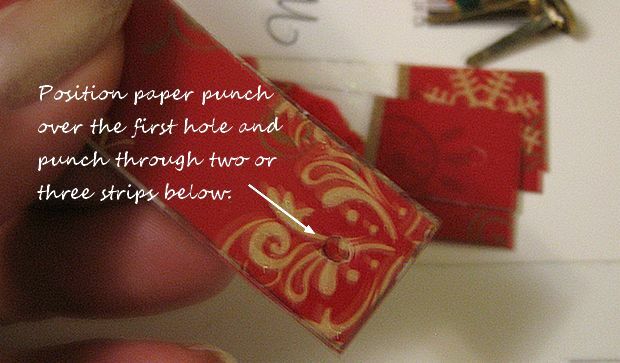 Decide on how wide you want the strips; the larger red and white ornament here was made with 1/2 inch strips; the others were about 3/4 inch, which are better for ornaments with less gaps between strips.The next step you can do in one of three ways. 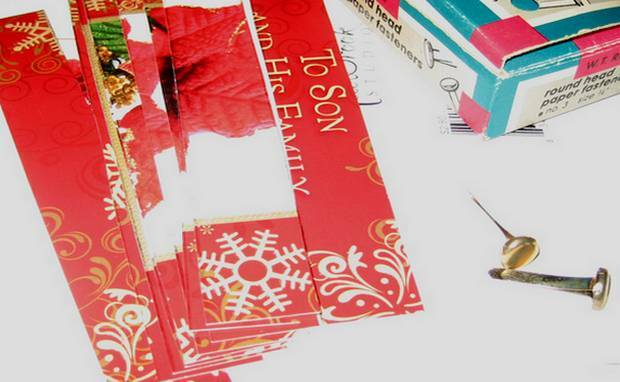 You can measure along the length of the card, and mark with a pencil equal increments where you will cut each strip. Or you can cut one strip off the end, position it back on top of the card at the end and cut another strip to match, continuing until you can’t cut any more. Or you can guesstimate, cutting as many strips as you can that are roughly equal in width. In each case, the strips will end up the same length as the original width of the card, which is the critical dimension in this project. Now you need to punch a hole in each end of every strip. You’ll want the holes to be in the same position on every piece and I found the best way to do this was to punch a hole where you want it on both ends of one strip and then place that piece directly over two more card strips, with all three card strips held together, positioning the punch so that it will reproduce the original hole in the top strip, going through the two below. Repeat this step until you have punched matching holes into both ends of every card strip. Stack the card strips together and insert a brass paper fastener, or brad, through the stack, going from the colored side to the blank side, as shown here. Turn the stack over and open out the tines of the paper fastener. Do not fasten the tines down too tightly, or you won’t be able to move the strips around. If desired, you can double over the ends of the tines so they don’t stick out beyond the edges. Hold the fastened stack and bend it in a “C” shape. This forms the curve of your ornament. Starting with the top blank strip, gently pull it sideways. Repeat with all the strips, fanning them out an equal space apart, until the ornament has taken shape. The gaps between strips will depend on how many strips are used and the length. You can also try different configurations for variations on the ornament shape. This ornament, which resembles a flat acorn, was achieved by cutting 3/4 inch wide strips, folding over each card strip at the same place, approximately one third from the top, then flattening the strips out again and stacking them as before. The rest of the assembly is the same, but when you fan the card strips out the ornament is flatter at the top and more pointed toward the bottom, resulting in an acorn shape. 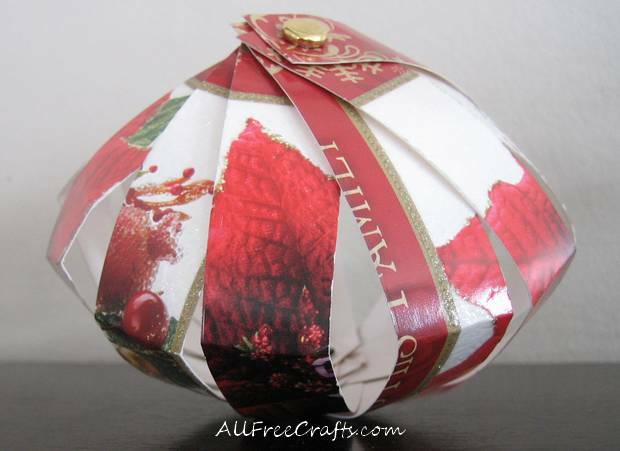 For a ball-shaped card ornament like the one pictured below, with virtually no spaces, try about 8 strips, each 3/4 inch wide and about five inches long, assembling as explained in Steps 3-5. As you can see, this is an imperfect science. A little space might still appear, but overall this globe, or ball-shaped, ornament works quite well. 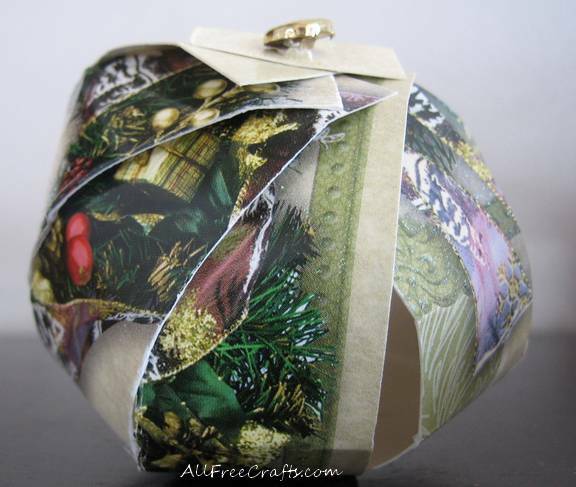 Once you get the hang of this, you’ll be able to make many different ornaments from strips cut from Christmas cards. Display them in a glass vase or fruit bowl; string them up at different heights like a curtain in a window; make a mobile of card ornaments, or, of course, hang them on the Christmas tree.